Sparkling Pink Skirt - A lovely short skirt for girls age 2-4. One of my husband's friends has a 2 years-old daughter which I met during a get together party. I told her mom that I will knit her a skirt and I just did. I just finished wrapping it up and ready to send this pink baby out to her. Description: A cute short skirt for girls age 2-4. 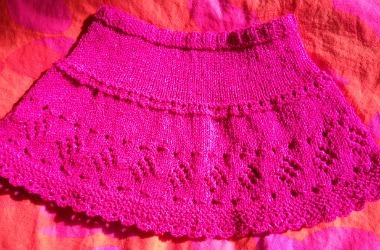 The skirt is mainly knitted in stockinette stitch in rounds using circular needle # 6. There are tree parts of the skirt - waistband, the top and the lower parts. An elastic waistband is used to support the waist of the skirt and make it fits better. I used the eyelet method to increase numbers of stitches for the lower portion. I applied a lace diamond border along the lower portion of the skirt. The crochet trim at the bottom is optional. You can easily make a bigger version of this skirt by using a bigger yarn and a larger needle. Then apply a longer elastic band as needed. Waistband: CO 108 sts. Join them in round and work 2 x 2 ribbing for about 1 inch. Purl one round. (place marker at the beginning of round 2). *k 2, yo; repeat from * to end. Knit one round. Purl one round. Bottom portion: K for 1 inch. Then increase sts evenly to make 168 sts total. 1st rnd: *k 1, yo, k3, pass the 3rd st on the right-hand needle over the first 2 sts; rep from * to end. 2nd rnd and every alt rnd: Knit. 5th rnd: K 3, *yo, sl 1, k1, psso, k6; rep from * to last 5 sts, yo, sl 1, k1, psso, k3. 7th rnd: K 2, *[yo, sl 1, k1, psso] twice, k4; rep from * to last 6 sts, [yo, sl 1, k1, psso] twice, k2. 9th rnd: K1, *[yo, sl 1, k1, psso] 3 times, k2; rep from * to lat 7 sts, [yo, sl 1, k1, psso] 3 times, k1. 11th rnd: As 7th rnd. 13th rnd: As 5th rnd. 17th rnd: As 1st rnd. 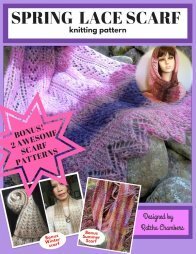 Continue knitting for about an inch less than your desired length then do garter stitch border (k one round, p one round) for 4-6 rnds. 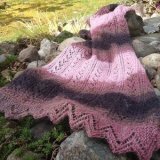 End off or continue with crochet edging below. *Ch 2, skip 1, 1 dc into next st, ch 2, slip sts into the next st; rep from * to end. Cut 19 inches of elastic band and stitch both ends together to form a ring be careful not twisting it. Turn skirt piece inside out. Fold the top 1/2 inch of the skirt over the elastic band and sew it with tapestry needle. Trim off all loose ends. Block piece if needed.